Mytchett, Surrey, 10 February 2015 – Frazer-Nash Research and Ecotive, the makers of the all-new Metrocab, are proud to confirm that the Metrocab has become the first zero-emission-capable taxi tobe licensed by Transport for London to operate on a trial basis as a London Hackney Carriage. The first few Metrocabs are already on the streets of London transporting fare-paying customers around the capital for the first time. British designed, engineered and built to help London meet its air quality targets, the Metrocab is a new generation zero-emissions capable range extended electric-powered taxi, and represents the cutting edge of green transport technology with styling both evolutionary and sympathetic to the iconic black cab. 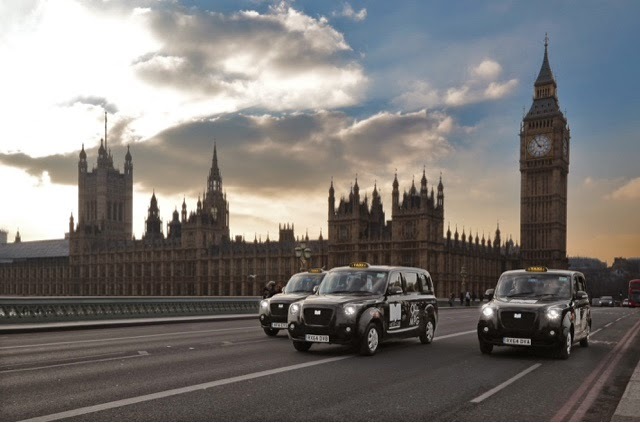 The Metrocab’s Range-Extended-Electric (REE) technology delivers a range of 560km, typically saving a London taxi driver £20-£40 per day based on the average cab duty cycle in the capital. There is still no confirmed launch date or in fact no news on the cost. It’s all very well producing a vehicle to meet stricter conditions of fitness, but if drivers can’t afford it, then it’s all been a complete waste of time and money. Having said that, of course we all want cleaner vehicles, cleaner air and we at Taxi Leaks would love to see this pan out as an overwhelming success story. Range Extended Electric Vehicles does seem to be the most sensible direction to offer London better air quality. But not at any price? We must not let ourselves fall into the trap of being the Mayors personal Guinea Pigs. Why haven’t range extended electric vehicles been trialled with London’s most polluting vehicles, such as the buses. There short routs between garages and bus stations make them the perfect place to start. As we saw in the recent 24hr strike, with under two thirds removed from the road, Central London’s pollution levels dropped by over 50%. As Taxi drivers we are at the forefront as a group who have to endure poor air quality affecting our health. So cleaner vehicles such as REEVs should promote better health amongst road users and pedestrians alike. But what are the real benitifs in comparison with the likes of Mecede’s and BMW’s cleaner euro 6 standard, Diesel engines? NextHow Safe Are Uber Drivers ? Who Needs Enemies? …. Hailo Backup Will Send You A Car If No TaxiAvailable. LTPH Compliance Exercise, Operation Neon, An Embarrassing Flop. Letter To Taxi News: Burn Your Bridges…And Learn To Swim Against TheTide. I have been trying to find out whether I can try one out as a fee paying passenger since I am disabled and confined to an electric wheelchair. The long running and ubiquitous TX cabs have proved a solution for distance travel for an electric wheelchair users but tfl have licensed a Mercedes cab which has too high a wheelbase and too low roof for an electric wheelchair. Since the new metrocab promises to replace all London cabs I am anxious to know how I can book one for trial? Looks good but what about servicing and repairs? Most london cab garages are only good for basic repairs as they are, in the main,thick and uneducated tossers who struggle to write their own names,yes you know who you are down at loughborough junction.Let us hope it does not go the way of previous metrocabs that skint everone that was involved in making and selling them.